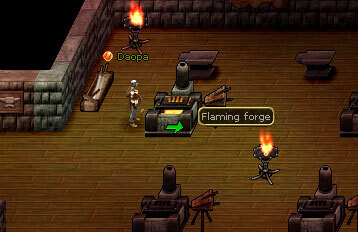 Double-click on the iron ore, then select the hot forge. After 6 seconds you'll be told whether you smelted it properly, or destroyed it. The odds of successfully smelting iron ore equals 14% + (Iron Smelting Skill / 2) + (Intelligence / 6). An iron ingot is worth 40, so you�ll get about 20 if you sell it at the Blacksmith Shop. Iron Forgers can forge iron ingots into iron items. Posted on 25 February 2009 at 18:29:05 by Anonym. this is hot! I love it!!!! Posted on 16 May 2009 at 19:02:14 by Anonym. Posted on 08 May 2010 at 00:46:32 by Anonym. Posted on 19 October 2011 at 04:18:33 by Anonym. Is there any resource that will let you smelt more than 5 at a time..like for milling , if you mill an old growth log you get 10 planks instead of 5. anything like that for mining?